Rep. Vicky Hartzler (r): What is that count, again? As we’ve come to expect, Rep. Vicky Hartzler (r) has difficulty counting. 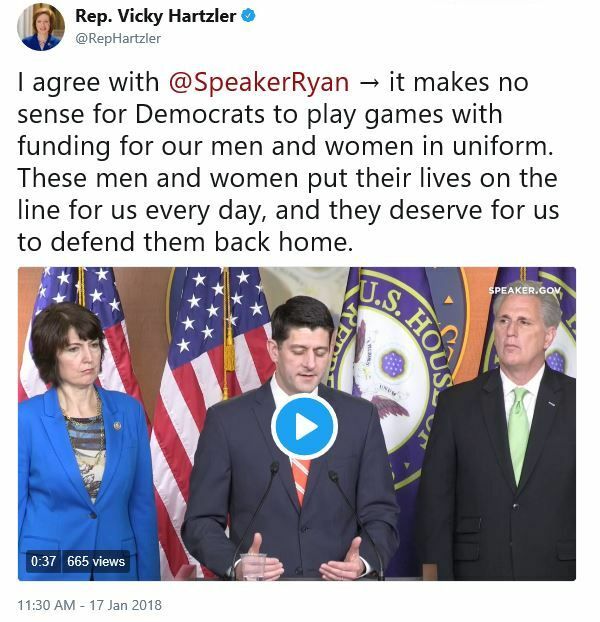 I agree with @SpeakerRyan → it makes no sense for Democrats to play games with funding for our men and women in uniform. These men and women put their lives on the line for us every day, and they deserve for us to defend them back home. We’re tired of the lying. Your party control both houses of Congress and the WH. This is on you. I guess it’s a good thing that the Democrats don’t control either house of Congress then? Honestly, ma’am, you aren’t fooling anyone. Republicans control the whole of the US government. Any shutdown is on you. Sorry, who controls the Congress again? Take sides with the devil? Nice. You’re to blame. You control Congress and can’t get anything done. I thought The Republicans controlled the house, senate and the White House. Why is this getting put on Democrats? Because she believes her constituents our stoopit. What about the man and women from Shithole countries that are serving in the Military? You don’t care about anyone but yourself. No surprise here….the GOP breaks it and then blames the Dems! You are morally corrupt, dishonest and have not a sliver of integrity….guess that is why you are a member of the GOP! GOP have control of Congress and the Presidency. Seems to me the GOP is used to blaming the minority. Vicky, we aren’t stupid. Get a DACA fix passed. You have had SIX months to do it. Dems are not the hold up. Apparently she thinks you are. You weren’t saying anything about that the last time your party shut down the government. Besides, the military and essential government personnel always get paid when the government is shut down. Dems not playing games. Reps and Trump created this situation you are playing with DACA lives. Reps have no room for negotiations, want everything and willing to deport DACA. No, someone must stand up to Rep and Yrump bullies!!! I’m going to flat out say it. You are a damn liar. The Democrats aren’t holding up anything for the military. How many months did you all sit on Merrick Garland? You’re holding all these DACA kids hostage. You are a freaking lying hypocrite.